Christianity equates cleanliness with godliness, but unfortunately many of the commercial cleaning products on the market are dangerous to your health. The Environmental Working Group (EWG) has just published their Cleaners Database Hall of Shame. The full report is due out in the fall of 2012. To empower consumers, the EWG Cleaners Hall of Shame, published in anticipation of the full database, highlights the worst of the worst – so far. I am not surprised by the products that have made this list, except for one. These are products I would never use in my home, even though I have fallen for greenwashing in the past. From oven cleaners to floor cleaners, these products are extremely toxic and many have been banned abroad. In fact, it is almost humorous, if it wasn’t so serious, for instance, that products designed to make air smell fresh in your home come with warnings stating they are “fatal if inhaled”. Isn’t that the point of an air freshener to be inhaled? Some popular cleaning products contain addictive inhalants. Inhalants generally have been abused by 1 in 5 American teens and are considered “gateway drugs” that lead to drug and alcohol abuse (www.inhalent.org). They are potentially fatal in concentrated form. Even a little inhalation can’t be good for you if concentrated inhalation leads to death. There were two products listed for greenwashing by EWG. The first one Simple Green is one we have previously exposed for simply greenwashing consumers for decades. The other product [amazon_link id=”B004714LJ4″ target=”_blank” ]CitraSolv[/amazon_link] you will find in my cabinet right now. In fact, I recommended this cleaner four years ago when I wrote the post about Simple Green’s greenwashing (see the comments). These concentrated liquids and ready-to-use sprays contain d-limonene and orange oils from citrus peels. According to the company’s worker safety disclosure, Citra-Solv concentrate is 85 to 95 percent d-limonene. That the oils are derived from citrus implies safety, but sprayed into the air, they can react with trace levels of ozone air pollution to form ultra-fine particles that penetrate deep into the lungs and formaldehyde, which the U.S. government classifies as a known human carcinogen. The California Air Resources Board advises people to limit the use of citrus- or pine oil-based cleaners on smoggy days to avoid exposure to particulates and formaldehyde. If I am understanding this correctly, the product is only unsafe because of air pollution. This does give me some relief, as I live in the mountains where air quality is better than smoggy cities; however, this raises a whole host of other concerns. What other products do we use that would otherwise be safe if our air was not so polluted? We have no dirty little secrets. Let’s face it, we’re consumers, too. Just like you, we want to know what’s in the products we bring into our home. 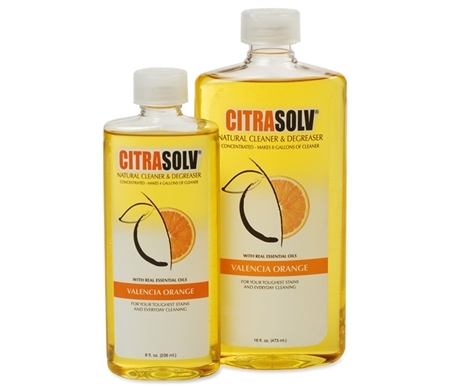 Everything that goes into CitraSolv’s products can be found on our labels and here on our website. The first thing we do when developing a new product is to carefully check out the ingredients that will go into it to make sure they are safe and naturally derived. We regularly review our existing products to ensure we are using the best ingredients available. I only use CitraSolv for tough jobs, like serious soap scum on the glass shower door, that no other “natural” or homemade cleaner can handle and can’t simply be scrubbed away. I still think it a better option than some of the more toxic cleaners, but the information discovered by EWG should appear as a warning on the label. I’m having trouble believing this — I have been using Citra Solv for years on everything! I completely trust this company and have to question the research done by EWG. According to them, the natural ingredient in Citra Solv, IF sprayed into the air, “can react with trace levels of ozone air pollution to form ultra-fine particles that penetrate deep into the lungs and formaldehyde.” What are the chances of that occurring IN MY HO– USE? And I’m not exactly careless when using any cleaning products, even the “natural” ones, so why would this stuff be needlessly floating throughout the air? As an Eco-conscious mom, I have enough to worry about! Why does EWG have to create this scary, highly unlikely scenario? ?